THE US’S CHIEF doctor wants more Americans to start carrying the overdose antidote naloxone to help combat the country’s opioid crisis and save lives. 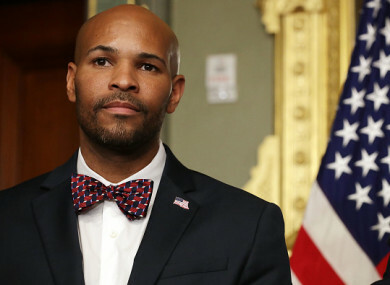 Speaking at the National Rx Drug Abuse & Heroin Summit in Atlanta today, US Surgeon General Dr Jerome Adams issued his office’s first national public health advisory in 13 years. “You don’t have to be a policeman or a firefighter or a paramedic to save a life,” said Adams, who pointed out that more than half of opioid overdose deaths in the US occur at home. Adams said 95% of all insured Americans are covered to purchase naloxone. Narcan nasal spray, one of the most widely available products, can cost around $80 (about €65) for one dose. Generic, injectable versions of naloxone are cheaper. For those who are uninsured, the antidote is often available at little or no cost through local public health programmes, Adams said. He also wants more federal funds dedicated to increasing naloxone access on local levels. Maine’s Republican Governor Paul LePage has been one of the most outspoken opponents of the push, arguing that naloxone doesn’t treat addiction and merely discourages people from seeking treatment by essentially offering a safety net if they do overdose. Adams said naloxone will not single-handedly solve the opioid crisis and should instead be used “in conjunction with expanded access to evidence-based treatment”. “There are people out there who think naloxone doesn’t make a difference: you’re just going to go on and misuse substances again,” Adams said. That would be like me saying I’m not going to do CPR on someone having a heart attack because if we save them, they’re just going to go out there and eat fast food and be back here all over again. Prior to his current role, Adams had been Indiana’s health commissioner, where he promoted needle-exchange programmes aimed at stemming the spread of diseases among intravenous drug users. Email “Americans urged to carry overdose antidote in effort to tackle drug deaths ”. Feedback on “Americans urged to carry overdose antidote in effort to tackle drug deaths ”.